My 7 year old son has been designing a dog robot for ages. He has diagrams with all the features it will have. 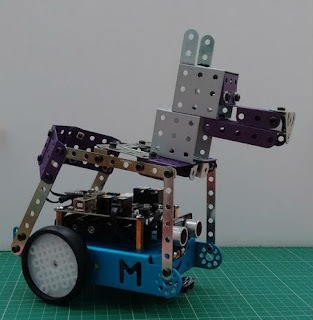 We've done some prototyping and settled on a combination of an mBot base plus Meccano (Erector) to create a dog shape. This means that the robot can be programmed with Scratch which my son already knows. He has lots more plans for things to add but he's pretty pleased with what we've got so far. The robot dog is named Roby after Ruby the real dog! Roby is a girl robot dog, like Ruby. Scratch is a graphical programming language for children. It's taught in a lot of primary schools and many secondary schools too. It's a fab language which enables creativity and coding. We've written before about how far kids can take Scratch. Adding the ability to control robots give Scratch even more scope. 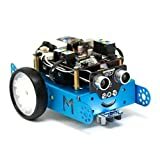 mBot is an inexpensive kids robot kit that is assembled from components. There's a basic robot to build but you can reconfigure it and use mBot as the basis for custom robots as we have one here. mBot can be programmed from Scratch. The MakeBlock software for mBot is built on Scratch 2.0. Older kids can also move on to Arduino programming of mBot robots. 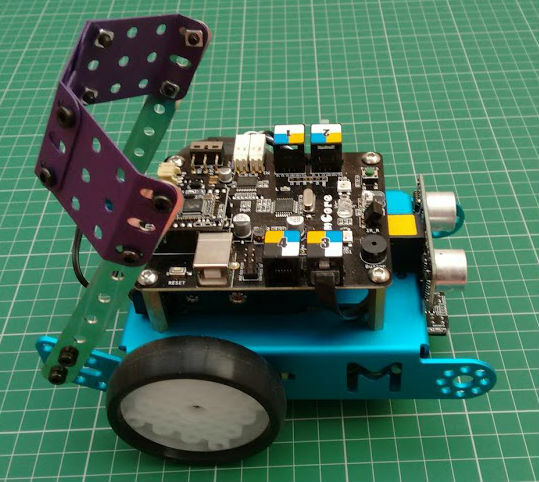 mBot has a powder-coated metal base and as well as motors for movement it has sensors, coloured LEDs, a tone generator and some excellent add-ons including servos, an LED faceplate and more coloured LEDs. We backed the original mBot Kickstarter project but the robot kits are now available to buy. You can read our full review of mBot to find out more. mBot isn't Meccano compatible. But it is possible to use Meccano to build on the mBot base. Note that the holes don't align perfectly but some just happen to be in the right place. We used pieces from our multi-model Meccano / Erector kit which worked really well to create a dog head and back and also to provide somewhere to attach mBot add-ons. We do have an mBot bracket pack which we have used for other extensions but it didn't have the right kind of pieces for this model. MakeBlock do have lots of other metal components, but my son wanted to build his robot today! So we made do with what we already had. Once we had built the dog we programmed it in Scratch. Movement is fairly easy and can be controlled either by the IR remote which comes with mBot or from a keyboard. We often use a mini remote keyboard paired with the laptop that's running Scratch. It can be tricky to get mBots motor perfectly calibrated so we tend to use the approach of turning and moving while a key is held down. Then you've got good control over the robot. We used the up arrow key to move forward and left and right arrows for turning. The code for going backwards sets the motor speed to a lower value because dogs don't usually walk backwards! We would have set it lower still but we've found that mBot's motors have enough power to move at all below a certain value. mBot makes a great base for custom robots. My son really feels like he is designing his own robot but the starting point of the mBot base means we can get things working quickly. Adding Meccano (Erector) gave lots of flexibility in the physical design of the robot. We've had our mBots for a while so my son knows what they can do which means he can come up with realistic ideas for what Roby can do. At 7 he needs quite a bit of help with Meccano and working out the best way to write the code. He has learned lots about physical engineering and making structures solid (and tightening screws!) He also learned about planning a project and adapting ideas as you go along and find out what it practical. 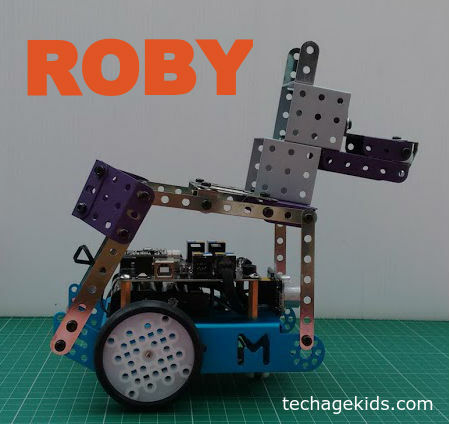 Subscribe to the Tech Age Kids mailing list to see future updates on Roby's programs and extensions. Scratch isn't proper computer programming is it?